The summer staple for rock fans that is Warped Tour recently kicked off its lucky 13th year and is showing no signs of slowing down. This was my sixth year going and I've come to find that with seven stages and over 50 bands, it would take a miracle of scheduling in order to see all the acts you'd like. Because of so much going on, Warped truly is an individual experience for every person that attends, which makes it a bit difficult to recap as a whole; however, I will at least take you through some of the highlights of my day. Walking through the gates situated at the middle of Shoreline Amphitheater, I was greeted with sounds of music in all directions. Not having yet familiarized myself with the layout of stages and booths, I headed to my left and ended up kicking off my day at Warped by catching The Briggs a few songs into their set. With songs reminiscent of the Dropkick Murphys and Social Distortion, they are a high energy punk band. Whether you are into their style or not, they put on a fun show and their catchy choruses are able to draw you in and keep your attention. Over on the adjacent main stage, Circa Survive was scheduled to be coming on soon. I was able to stand side-stage for them, which was a great experience; you become even more aware of the band's energy -- and Circa, especially lead singer Anthony Green, is full of it (energy, that is) -- and even more so the crowd's. Their set mostly consisted of songs from their new album, On Letting Go, which was released just over a month ago and is filled with more of their trademark melodies and Green's distinguishable vocals. In Shoreline's main seating and lawn area, the stage was split in two to act as a home for Warped's Smartpunk and Hurley.com stages. The first of several bands I watched there was The Vincent Black Shadow. Having not heard them before, I wasn't sure what to expect, but was very pleasantly surprised. Lead by singer Cassandra Ford, they are a four-piece band from Vancouver with great stage presence and catchy, hook-driven songs that I can only think to describe as a combination of No Doubt-esque rock with touches of cabaret and jazz. They look to be a promising act to look out for in the future. One of my personal favorites, The Matches, won the Energizer contest for an extended set at this date. As this was their "home" show on the tour, it was well-deserved and easy to see why they won based on the enthusiastic audience that gathered to watch. Even after the extra 10 minutes, which ended with lead singer Shawn Harris in the middle of the crowd, everyone joined in to chant, "One more song!" The band mixed their set well, including favorites from both their albums, such as "Dog Eared Page" and "Sick Little Suicide" from E. Von Dahl Killed the Locals, and "Salty Eyes," "Papercut Skin" and "Didi (My Doe)" from their more recent release, Decomposer. Having followed these guys since they were known as The Locals many years ago, I have always considered them a must-see live because you are guaranteed a good time and nothing short of an incredible performance by all members. 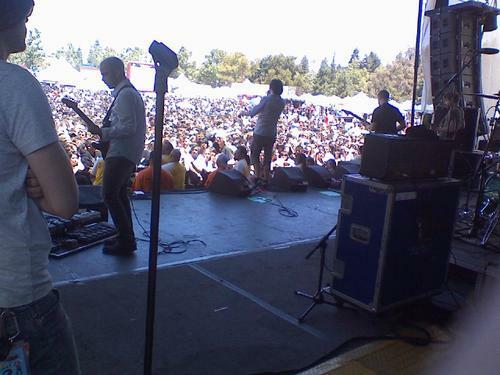 Following The Matches on the Hurley stage was one of the other bands I was most looking forward to seeing: Bayside. Their new album, The Walking Wounded, is absolutely fantastic. Though this was my ninth or tenth time seeing them, it was the first time since its release, so I was anxious to hear the songs performed live. The set list featured some of the strongest on the album, such as "Carry On," "Duality," "They're Not Horses, They're Unicorns," and the title track, "The Walking Wounded." With older crowd favorites, "Masterpiece" and "Devotion and Desire," thrown into the mix, it was a flawless set from start to finish. Overall, Warped has itself yet another strong line-up this year. Whether you stick to the bigger acts on the main stages, or hit the side stages and discover some new favorites and diamonds in the rough, the bands will not disappoint. Lucky 13, indeed. Nice review Tay! I can't wait til Warped! Sounds AwEsOmE !! Im sooooo ExCiTEd ! good review Tay ! I could actually see the Locals, er the Matches through your words! Can't wait 4 your next review..very descriptive ! Taylor rocks. You're such a good writer! Great review! Makes me wish I was there! Great review!!! Can't wait to read the next one. Wish I was there! Man, now I wish I'd gone to this. Nice work Taylore! awesome awesome review. can't wait. You are a great writer!! I can't wait to read more of your reviews. Excellent review. Makes you want to go to see the show. oooh, this makes me more excited for warped tour! Hey - loved the piece. I've never heard of the Matches but think I will go and check them out. Looking foward to more great reviews. Very nice write-up. Wity and enjoyable to read!! Nice review. Some good tips on new music to check out. How do you remember all the songs that are played, I never can! Great review! Makes me miss the days I used to be a concert go-er! I'm sooo excited for Warped!!! I can't wait to see Bayside. You saw a lot of my favs! Great review!